We were invited to spend the day at Paradise Wildlife Park in Broxbourne. Although it’s one of the most popular attractions for kiddies in Hertfordshire, and Europe’s leading zoo, we had never been before so we were really looking forward to our visit. Ethan brought a friend along and they were both super excited to check it out, especially the brand new World of Dinosaurs which launched this year. In our review of Paradise Wildlife Park, I’ll share our day along with some helpful tips to help you plan your visit. Paradise Wildlife Park is situated in Broxbourne Woods, around one hour’s drive from Letchworth. There is plenty of car parking space and it’s free. If you’re getting the train to Broxbourne, there is a pick-up service which costs £3 per person (free for under twos) – they’ll also bring you back. There is a number to call at the station. There’s a lot to see so a bit of planning will help. You don’t need a detailed itinerary but just an idea of the main things you’d like to see and do. The park is roughly split into two, with most of the animals on one side, and the adventure playgrounds and World of Dinosaurs on the other. When you arrive, you’re given a map which also details specific times for theatre shows, animal talks and feeds throughout the day, so it’s worth having a look at this first in case there’s something you don’t want to miss. You can also pay extra for animal experiences. Our day began at Lorikeet Landing, looking at all the amazing birds. Squawky parrots, colourful toucans and what has to be The MacDaddy of all owls – the Great Grey Owl. Seriously, check this dude out! We had hoped to do Safari Golf but unfortunately it was closed due to the time of year (Ethan is such a keen golfer he’d probably still try to play in the snow) but we’ll definitely be back to give it a go when it’s open again. Instead, the boys spent a bit of time at the Monkey Mayhem play area, mostly on the big slide. We also met Pluto, one of Santa’s beautiful reindeer. Check out those magnificent (and terrifying) antlers! There is a takeaway pizza place right next to Monkey Mayhem but we wanted to sit in the warm, so we headed to lunch at Safari Sam’s Diner. There was plenty of seating and the usual fast food lunch offerings such as burgers, jacket potatoes and sandwich lunch bags for the kids (these had cheese or ham sandwiches, juice, apple, Pom Bears and a chocolate wafer biscuit). There are toilets and a baby change here too. Once we were fed and watered, it was on to the hotly anticipated World Of Dinosaurs. The entrance is rather grand, and it’s set along a winding, woodland trail. You really do feel as though you’re in a Jurassic Park film. Sadly there’s no buff Chris Pratt here waiting to fling you over his shoulder. BUT, there are 30 animatronic dinosaurs, which are very lifelike. They move, they make noises, and they’re massive. Dinosaur fans will be in their element here. There are so many different species to see, and I like how they are all dotted around the woods with plenty of space around them. You feel as though you can really explore. You can even climb in a jeep and get a brilliant Jurassic Park-style photo. Get your acting skills at the ready, people! The Rex Express is a little train ride that takes you around the dinosaur park. It costs £2 per person and takes a few minutes. After the all the dinosaur excitement, the boys were keen to go to the adventure playground. There’s plenty of stuff here to keep them amused probably for a couple of hours, so it was hard to get them to move on to be honest! They really enjoyed climbing on all the frames, and they had a go at the Pirates Cove, which cost £1 each. When we finally managed to drag them away from the adventure playground, we headed towards the main Animal Park. I think we visited all the main areas but there is so much to see we may well have missed something! We explored the Reptile Temple, Outback Trail (including zebras, camels, meerkats, wallabies, armadillos), penguins, Amazon and beyond (including snakes, alligators, piranha, monkeys), and of course, the Big Cat Territory. This isn’t a comprehensive list, there are so many animals to see I can’t remember them all! The Big Cat Territory is quite spectacular. As soon as you enter the space, you feel quite in awe of these beautiful creatures. It is home to tigers, jaguars, cheetahs, snow leopards and lions. Sometimes you can feel as though enclosures are too small but here, they have plenty of space to roam about and seem very well cared for. Paradise Wildlife Park has its own registered charity based at the Park – the Zoological Society of Hertfordshire. If you want to get involved in fundraising and conservation, you can chat to the team here for more information on how to get involved. Donations go to important conservation projects around the world. Find out more on the website. There does, of course, have to be a visit to the gift shop. It’s very festive at the moment and you can get all manner of animal and Christmas-related items. The boys came away with Llama poo (don’t ask), a fridge magnet and a ruler. I think we got away quite lightly there. If you don’t like crowds, then visiting at this time of year is ideal. Yes, it’s cold, but wrap up warm with plenty of layers and you’ll be okay. It was quiet, we didn’t have to queue to see any of the animals and the whole place had a lovely festive feel. I can imagine that it gets crazy busy during the summer. The only downside is that a few things will be closed, like the splash park and mini golf. The boys had a great time. They didn’t want to leave, even though it was starting to get dark (have a bribe ready for the car journey home). They were full of stories about the day and about how much fun they had had. Overall, we had a brilliant day out. It’s fantastic for the kids to be able to learn about animals that they wouldn’t normally get the chance to see in real life. We don’t have any pets at home, so Ethan isn’t really around animals that much. I’m so pleased we had this opportunity to visit Paradise Wildlife Park and show him how amazing and important animals are. An adult day ticket costs £18.05 and a child ticket costs £15.68 (under twos are free). If you book online, you can get a 5% discount (please note these are mid-season prices and are correct at time of press). Please check the Paradise Wildlife Park website for the latest prices. Make sure you have a bit of change on you on in case you want to ride the Rex Express or play games like the Pirates Cove. 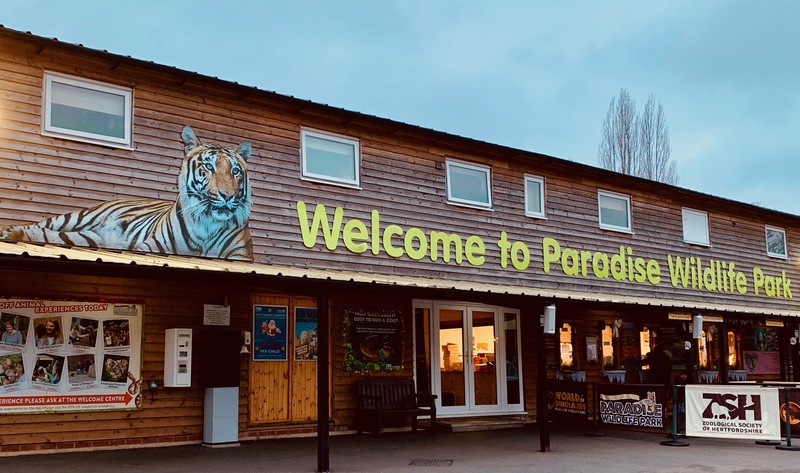 I hope you enjoyed our review of Paradise Wildlife Park and found it helpful. We had a great time and will definitely return. If you’re thinking of visiting, please check out the Paradise Wildlife Park website for more information. Disclaimer: Mums Off Duty received a complimentary family ticket to Paradise Wildlife Park for the purpose of review. My reviews are always completely honest.